This page updated for 2019. Click here for the site directory. Please consider linking to this site! There is a charming poster that shows a full-color closeup of a few cloves of garlic; it is labelled “Italian caviar,” and that sums up garlic excellently. Garlic qualifies as a great vegetable because not only is it an indispensible cookery ingredient, it can well and delightfully be eaten as and for itself (squeeze the paste from roasted garlic out on some lightly toasted French/Italian bread, pop a young, slightly acidic red wine, and preview Paradise). There are a myriad types of garlic. They can be classed in hierarchies, the top levels of which have some botanical significance and the lower levels of which are more expert experience than botany (at least so far—the field is still advancing). The critical factors in selecting even classes of interest are two: taste, and storage ability (for there is no point in growing a year’s supply of a kind that only keeps for a few months). Suitability for growing is third by so much that it scarcely figures in out here; to the minimal extent that it does, it would be to eliminate that class called “Creole” garlics, which “perform best in mild-winter and southern climates”. Here, then, are the key data. There are three main subdivisions of hardnecks (“rocambole”, “porcelain”, and purple stripe“) and two of softnecks (”artichoke“ and “silverskin”); some have further subdivisions. Here are those divisions, and some taste notes (not from us). Rocamboles, however, have a tendency to dehydrate in storage under dry conditions (less than about 50% humidity), which we tend to have out here. So far, so good; but now it gets harder. We need to choose within the types specified above. At this level, one has to go by either extensive personal experience (which we lack), or the catalogue descriptions in the seedsmen’s catalogues. And, at the outset, one has to be prepared to experiment for a few seasons. This season, we’re looking at 32 garlic plants—that equates (under ideal conditions—full growth and no storage losses) to using about a bulb (not a clove, a whole bulb) of garlic every 11 to 12 days. Cloves per bulb can vary a lot, ranging from 4 to 12 or 14 or even 16; if we reckon an average of, say, 8, that’s not far from a clove a day—which is actually light usage for a household that likes garlic, but it’ll do for now. Time of planting is critical since both optimum shoot and bulb development require a cold treatment. Garlic . . . should be planted in the fall—usually within one to two weeks after the first killing frost (32° F).…Ideally, roots should be developing and shoots should be emerging from the clove but not above the soil at the time of the first hard freeze (28° F). Garlic shoots will emerge from the ground in [the spring]. 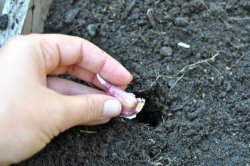 Unless given a proper cold treatment prior to planting, garlic planted in the spring will often produce weak shoots and poorly developed bulbs. 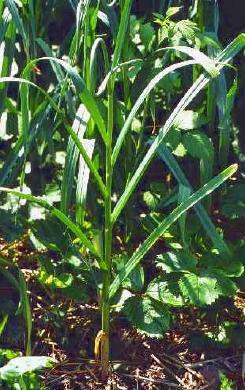 Lack of scape development in hardneck garlic and bulbing in all garlic is usually due to an inadequate cold treatment. Out here, the average first overnight low of 32° comes in early October (the 5th); the first dip to 28° (again, on average) comes about a week later, on the 12th. It thus looks like we should roughly target early October for our garlic planting—but perhaps the best plan of all, for us or you, is to consult a reasonably local garlic authority, preferably your chosen seedsman supplier. Garlic wants a sunny spot. The soil should be rich (but not too rich, or the tops will overdevelop). Garlic does not do well in really sandy or really clay-ey soils, or soils lacking in organic matter; the soil should be loamy, and well-drained. While one can add soil amendments, there’s usually little one can do about excesses already present. Still, research has shown that high phosphorous levels can decrease plant height, average bulb weight, and usable yield, so keep that in mind. Obviously, one always plants garlic where it is to grow. Plant individual cloves with the root end down—be sure you don’t set them upside-down! The “pointy” end goes up—the flat end goes down! Set them an inch or two deep. Mulch them as soon as they are planted, using some loose stuff that the emerging stalks can easily penetrate (straw is excellent). Some sources say to set them 6 inches apart; others—deep-bed sources—suggest that 4 inches will suffice. Obvious, but probably worth saying anyway: large cloves will produce large bulbs, and small ones, small; save the smallest cloves from your seed bulbs (usually the interior ones) for kitchen use and re-plant only the larger ones. Garlic is pretty winter hardy, but it can be damaged by a combination of very cold temperatures and a thin snow cover. If such conditions arise, or seem likely to, cover your garlic with a mulch of straw to protect it (probably a good idea in any case). In the spring, the garlics will send up greens through the mulch. When those emerge, begin watering them, more or less like any garden green. If you can apply some extra nitrogen at this time, so much the better. Somewhere around mid-May, the garlics will finish their green-growth stage and start bulbing up. Around that time you can slightly cut back their watering. Vital note! Hardneck types will, somewhere around early June, send up a flower stalk: keep a close eye on it. About a week after those stalks begin to uncoil, turn woody, and stand upright, cut the stalks off about ½ inch above the top plant leaf. Fail in that, and you’ll get little if any bulb. As your anticipated harvest time approaches, keep watering minimal: the topsoil should not be really wet, or the bulbs may mold, or at least stain. As harvest really draws nigh, the leaves will start turning from green to brown. Opinions vary about exactly when to strike, but expert consensus seems to be soon after half or so of the leaves have gone brown. Do not wait for most or all of the leaves to go brown. Harvest by simply taking the bulbs out of the ground. Do not leave freshly dug bulbs in direct sunlight for more than a very few minutes—they will more or less cook. Hang dug bulbs somewhere indoors and let them cure—two or three weeks is probably what that will take in our climate. When curing is satisfactorily complete, the neck of the plant can be cut about ½ inch above the bulb without any moisture showing (if you try it and detect moisture, curing is not complete). Cured garlics can be neck- and root-trimmed and stored in hanging net bags (like onions). Modern garlics are of only two species: Allium ophioscorodon, the “hardnecks”, which produce a flower stalk as did their wild ancestor; and A. sativum, the softnecks, which usually do not produce a flower stalk. The Allium genus is part of the Liliaceae, the lily family—which includes onions, leeks, and asparagus among its more useful edible members. Let’s not re-invent the wheel: this USDA site (also linked above) covers the ground. Since you're growing your own vegetables and fruits, shouldn't you be cooking them in the best way possible? Visit The Induction Site to find out what that best way is! If you like good-tasting food, perhaps you are interested in good-tasting wines as well? Visit That Useful Wine Site for advice and recommendations for both novices and experts. This site is one of The Owlcroft Company family of web sites. Please click on the link (or the owl) to see a menu of our other diverse user-friendly, helpful sites. Like all our sites, this one is hosted at the highly regarded Pair Networks, whom we strongly recommend. We invite you to click on the Pair link for more information on getting your site or sites hosted on a first-class service. All Owlcroft systems run on Ubuntu Linux and we heartily recommend it to everyone—click on the link for more information. You can click on the logo below to test this page! You loaded this page on Friday, 19 April 2019, at 16:27 EDT. It was last modified on Wednesday, 30 January 2019, at 01:35 EST.